This man here is Jaime Estrada Medranda, the president of Ecuadorian top flight side Manta FC who, lest we forget, are proud owners of the very best/worst club crest in all of South America. Or rather, this is Jaime Estrada Medranda, the former president of Manta FC because, as of a few weeks ago, he resigned his post to resume his career as a player. Medranda called time on his burgeoning footballing career in 2002, when he decided to give up his spot in the Manta FC youth team to go to college and pursue a degree in Business Management. Eight years later, and with his degree under his belt, he returned to Manta in 2010 – not as a player, but as club president. 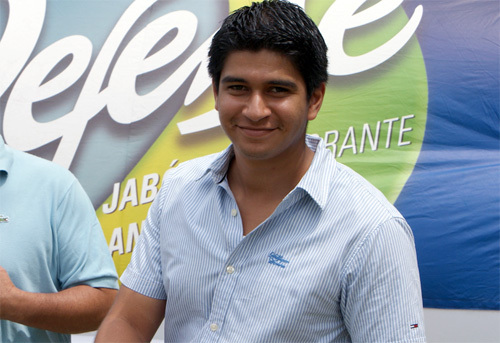 However, after three years in the job, Estrada Medranda, now aged 28, suddenly got the urge to rekindle his playing career and, after learning that Ecuadorian league regulations wouldn’t allow him to hold both positions simultaneously, resigned as president of Manta in order to re-sign as a player at his beloved club. Just to put the icing on the cake, over a decade since he last played, Estrada made his senior debut for Manta at the weekend and scored after coming on as a late substitute in a 4-0 win over El Nacional.